As for many breeds, the recognition of certain colors is a matter of “standardized” looks, as if dogs were mass production like cars. The point of keeping some colors even if they can’t be showed in the ring is to keep some traits that have always been in the breed. There are some people that prefer those “off” colors as they are not very common so their dogs looks apart from the others. One nice eexample of that is the doberman with the isabella color. I know that even if you breed 2 isabella color dobs, you won’t get isabella pups. Nevertheless, the isabella color isn’t accepted in the “standard” but they are very much desired by many people. If one of you came across an isabella doberman will certainly agree how beautiful they are (http://www.dobermann-pedigrees.com/cilvercliffizkorolevstvadallaba.htm). Conclusion : the point is to have a dog that has a perticular trait that makes it apart from others (and those “off colors” that are part of breeds but not accepted in comformation meets that). Isn’t the merle color necessary in order to create harlequins? Why the hell isn’t it allowed in the show ring?! On the merle thing – no clue. 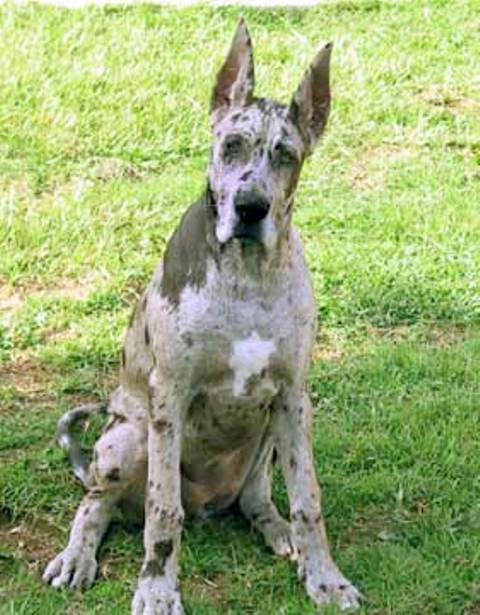 The only merle danes I know that are cropped all have pet crops,but cropping danes really seems to be falling out of favor for pets- possibly the expense is a strong factor. You’re probably right… my only problem is that I have seen 2 isabella bred together and none of the pups were that color… but anyway, this isn’t the point of this thread ! I believe merle is a by-product of breeding for Harlequins. Some people like the cropped look and are willing to crop even if the dog can’t be shown. Plenty of pet Dobes are cropped. really dont see the point in ear cropping. seems to me to be a cruel and unneccesary thing to do to a dog just cause it is in the breed standard. what is so wrong with normal ears or for that matter a nice long tail on a dog. im so glad my 2 cockers have the tails they were born with. i am also glad i live in the uk where ear cropping was outlawed long ago and now thankfully so is docking. we humans sure do have a lot to answer for. we create dogs that are so extreme they cant be dogs, or we go chopping bits of them just to suit our personal prefrances. And dont try to convince me they need there tails of or there ears pointy for health reasons cause they dont it is just humans like most things that are wrong in this world.